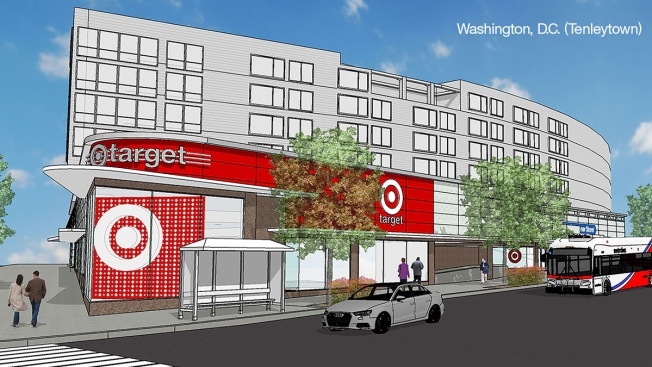 Rendering of a planned small-format Target store in Tenleytown. Retailer Target has big plans to open relatively small stores in two D.C. neighborhoods, continuing their expansion in the capital. The superstore signed a lease this week to take over the former Best Buy space at 4500 Wisconsin Avenue NW. A company spokesman said they will open the city's fourth small-format Target there. The space, which is about 46,000 square feet, became available after the electronics retailer moved out. The new store set to open in 2020. The same year, Target plans to launch a slightly larger store at New York Avenue and 16th Street NE. That space is about 67,000 square feet — Still a fraction of a typical store that could exceed 100,000 square feet. Target is working to expand into cramped suburbs and cities stores, where there are plenty of shoppers but limits on available real estate. Two small-format Targets, in Cleveland Park and on Georgia and Eastern Avenues NW, are set to open in early April. The expansion in the area isn't limited to D.C.: In 2020, a store is also planned for Oxon Hill, Maryland. A spokesperson for the store says more details will be released closer to the opening date.